The Iridium GO! 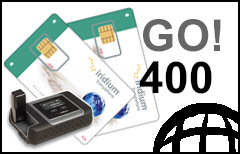 400-min Prepaid Plan provides a discounted rate for Iridium GO! data calls throughout the Iridium's global satellite coverage.